This was an amazing day. Saturday afternoon we were taken to the Apartheid Museum and this was fascinating, shocking and moving but ultimately it is the inspirational element that stays with you. 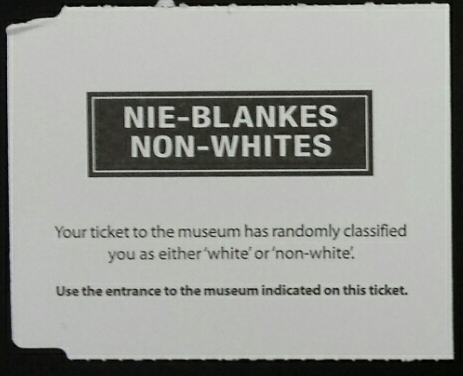 On entry you are given an immediate jolt when you see you have been arbitrarily classed as either white or non-white. We are all familiar with parts of Nelson Mandela’s story and some of the terrible acts carried out under apartheid, but coming here to see and hear so many exhibits, anecdotes and quotes makes for a deep experience and gives a real sense of the struggle. You simply have to admire the South African people for how far they have come. No photos are permitted inside but this picture below of some of our team was taken just outside. We followed the Mandela trail to Soweta and visited his simple home. He has left us numerous inspirational quotes and this one features prominently in the back yard of his former home. Also in Soweto, we stopped at the Hector Pieterson memorial, commemorating the children who died during the student uprising in 1976 when police opened fire on the demonstrators. For the evening we returned to Johannesburg and enjoyed a relaxed introductory meal with our clients in a very upmarket mall off of Nelson Mandela Square. 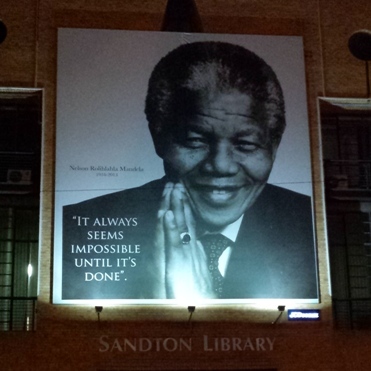 Looking down on the square is a huge portrait of Mandela with some words to inspire us all when we see a supposedly insurmountable problem ahead. 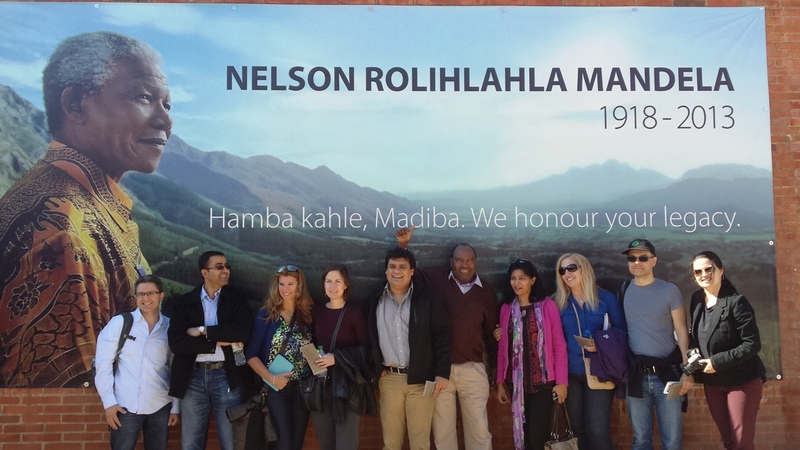 This entry was posted in South Africa - IBM CSC and tagged #ibmcsc, #SA12, Johannesburg, Nelson Mamdela, South Africa on June 22, 2014 by Leigh Salkeld. In the morning we visited the IBM office in Johannesburg and met the General Manager for South Africa, Abraham Thomas, spending a couple of hours learning about IBM’s strengths and challenges here. I was particularly interested to learn that the law now requires that every organisation should mirror the population of the country, so 60-70% of employees should be of either black or African descent. This means that there is an ongoing focus on training and recruiting from the country’s previously disadvantaged communities. The equity of this is undeniable and it illustrates how far the country has come but it takes time and attention to achieve this kind of transition. The message was reinforced again that our purpose as part of IBM’s Corporate Service Corps is not to win business for the company. Instead it is a corporate social responsibility initiative that aims to bring about lasting change for communities in developing markets whilst providing global leadership training for the IBM team. This entry was posted in South Africa - IBM CSC and tagged #ibmcsc, #SA12, Johannesburg, South Africa on June 22, 2014 by Leigh Salkeld.